We may ask for a picture of an ID document such as a passport, driver's licence or government issued ID card to help verify your identity. If so, this picture will be scanned by our identity verification service provider and will be stored safely and confidentially, in line with our Privacy Notice. Upload a photograph of your document. Scanned documents will not be accepted. Ensure that your document is valid and has not expired and is without hole punches or other modifications. Ensure your document is well-lit, but without glare. Natural sunlight is best. Photograph the entire document and avoid cutting off any corners or sides. 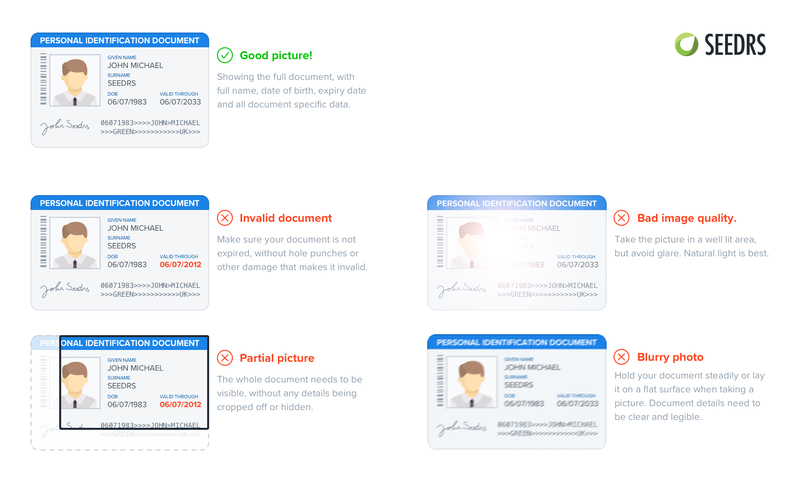 Ensure the ID document is fully visible and in focus. You can choose to upload your picture using your mobile phone’s camera. You’ll need to enter your mobile number when prompted and we’ll send you an SMS with a link to continue the process on your mobile phone. Make sure your picture doesn’t have any logos or watermarks on it. Do not hide or cover any information on the ID. This document should be sent as a .jpg, .png or .gif file and it shouldn’t be bigger than 10MB.